This is a simple stuffed tofu snack, enjoyed by many Malaysians. As mentioned in the video, the tofu over here in Vancouver, Canada is very dense. Hence I have to remove some of the flesh to create a pocket, before stuffing it with bean sprouts and cucumber. Otherwise, just make an incision through the middle of the tofu, and stuff with all the vegetables. 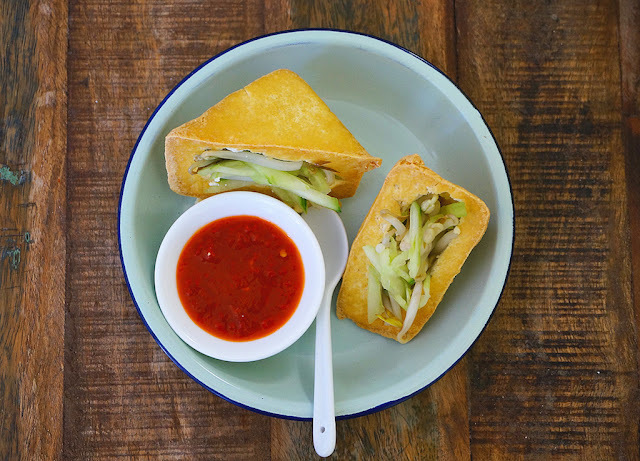 Serve the fried tofu with some homemade sweet chili sauce. It is simply delicious! Heat oil over medium to high heat. When the oil is hot, add tofu, and fry until golden in color. Remove and drain on paper towel. To serve: Stuff the tofu with cucumber and bean sprouts. Top with some homemade sweet chili sauce.